"For a former general who faces serious crimes against the Filipino people and who still maintains clout within the military, running for senatorial race is very dangerous. He should, in fact be in a regular civilian jail. Allowing Palparan to run for any position in public office is the height of impunity," Karapatan chairperson Marie Hilao-Enriquez said during the trial of Ret. Maj. Gen. Jovito Palparan Jr. at the Malolos Regional Trial Court Branch 15. Please join us in our call for the immediate release of political prisoners Emeterio Antalan and Leopoldo Caloza who were convicted of murder on September 17, 2015 by the Pasig City Regional Trial Court Branch 266 after six years of trial. Their arrest is already a violation of the JASIG, their conviction is even a graver offense. With all due respect to Prof. Winnie Monsod, her red tagging might just spur intensification of human rights violations in Lumad communities. Her red tagging of people’s organizations and human rights groups only encourages, and even justifies, more extrajudicial killings, threats and harassments among the Lumad who are trying to protect their ancestral land and culture. "Two more lives were taken in defense of their land," Marie Hilao-Enriquez, Karapatan chairperson said following the killing of couple Roger and Lucila Vargas on September 19, 2015 in San Jose Del Monte, Bulacan. The Vargas couple was in the middle of a land dispute with the influential Singsons of Ilocos Sur who claims ownership of the couple’s 2.5 hectares of land. The Singson family is also after at least 11 hectares of land in San Isidro Village, San Jose del Monte, Bulacan, occupied and tilled by many other farmers. In a conference organized by German human rights advocates and church workers in Berlin, Karapatan Secretary General Cristina Palabay called on the international community to support the call for justice for the 282 victims of extrajudicial killings in the Philippines, including the 49 Lumad killed under the Aquino administration. Who are the AFP-backed “Datu”? "The attempts of the Armed Forces of the Philippines to deny their links to the Magahat-Bagani paramilitary groups involved in the massacre of three Lumad leaders and to discredit the communities they victimized backfired when they presented before the media the so-called datu of Mindanao who turned out to be known leaders of paramilitary groups,” said Marie Hilao-Eriquez, Karapatan chairperson. “It is tempting to ignore the Armed Forces of the Philippines’ use of red baiting tactic against rights advocates and journalists. We all know it is a sign of panic or a work of dimwits to whitewash their crimes against the people. 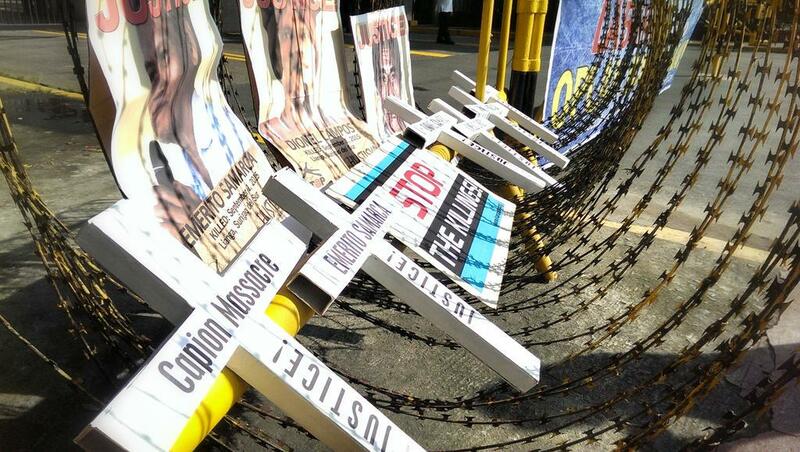 But history also tells us that most of the victims of extrajudicial killing, enforced disappearance, and illegal arrest and detention were first victims of red tagging by the regime and the military,” said Karapatan Chairperson Marie Hilao-Enriquez. “There may be no formal declaration of martial law under the Aquino regime, but the repression and terror it perpetrates are the same as they were during martial law, especially in the countryside. The proliferation and use of paramilitary groups as surrogates of the military are the same today as they were during martial law,” said Karapatan Chairperson Marie Hilao-Enriquez. Progressive lawmakers, human rights advocates and relatives of deceased legislator and labor leader Rep. Crispin “Ka Bel” Beltran today filed a petition for the writs of amparo and habeas data at the Supreme Court in Manila, to decry threats to their “life, liberty and security” with the existence of a “hitlist” containing names and pictures of seventy (70) activists in Mindanao and national leaders of progressive organizations. Witnesses and relatives of slain Lumad leaders and tribal school executive director in Lianga, Surigao del Sur who went to the Department of Justice today for a meeting with Secretary Leila De Lima were disappointed to find found out that De Lima was in Malacanang to respond to an urgent call from the President. The meeting between the Secretary and the Lumad was set more than a week ago. Lumad delegation refused to meet with a DOJ Undersecretary who faced them. "Kabisado na namin,” said Cristina Palabay Karapatan secretary general on the BS Aquino regime and the AFP’s standard reply when confronted with issues of killings and other human rights violations they have committed against the people. "There's no reputation to 'besmirch'. The AFP’s reputation has long been stained with blood of the Filipino people,“ Karapatan Secretary General Cristina Palabay said in reaction to the Armed Forces of the Philippines' statement that groups like Karapatan are ‘besmirching’ its reputation even in the international community. "We want international bodies to know what is happening in Mindanao—that the Lumad, in defense of their land, are being killed and forced to leave their communities," Karapatan secretary general Cristina Palabay said. Karapatan brought to the attention of the United Nations Human Rights Council the killing of Lumad leaders Dionel Campos and Datu Juvello Sinzo, and ALCADEV school director Emerito Samarca. Karapatan asked for an investigation on the killings and the evacuation of almost 3,000 Lumad in Surigao del Sur through letters* sent to Dr. Chaloka Beyani, SR on the Promotion of the Human Rights of Internally Displaced Persons; Christof Heyns, Special Rapporteur (SR) on extrajudicial, summary or arbitrary executions; Michel Forst, SR on Situation of Human Rights Defenders; and Victoria Lucia Tauli-Corpuz, SR on Rights of the Indigenous People's. "We are asking the UN HRC to investigate and recommend actions to the Philippine Government on these issues," Palabay added. September 7, 2015, Lianga, Surigao del Sur – Witnesses to the September 1, 2015 killing of MAPASU Chairman Dionel Campos, ALCADEV Executive Director Emerito Samarca and Manobo Datu Juvello Sinzo and other complainants formally filed criminal charges against known perpetrators and other John Does at the Surigao del Sur Prosecutor's Office in Lianga late this morning. Human rights advocates and supporters of Eduardo Serrano such as former political prisoner Andrea Rosal today called for the immediate release of Serrano for “sheer lack of evidence against a man who was abducted, tortured, and imprisoned for nearly 12 years.” Serrano, peace consultant of the National Democratic Front of the Philippines is undergoing trial for trumped-up multiple murder and frustrated charges at the Quezon City Regional Trial Court Branch 98. All victims of false criminal charges. NDFP peace consultant Eduardo Serrano with Andrea Rosal, newly released from prison. “The victims, their kin and the witnesses have spoken: the Armed Forces of the Philippines and its paramilitary forces are responsible for the grave crimes and atrocities against them, their tribes, and their communities. There is a distinct pattern in the 262 documented victims of extrajudicial killing and the 292 victims of frustrated killings, especially in the cases of the killing of the Lumad in Mindanao: they were defending the people’s right to land, ancestral domain, social services, among others, and they are persecuted and killed. Karapatan today called for the release of 536 more Andrea Rosals who are in jail because of false criminal charges. “The case of Andrea Rosal proves that political prisoners are illegally detained and should be immediately released because the charges filed against them are fabricated, backed up by “professional” witnesses hired and coddled by the State, and justified only through the use of “planted” evidence,” said Cristina Palabay, secretary general of Karapatan. Please join us in our call to stop criminalizing human rights work and advocacy; and withdraw false criminal charges against human rights victims, human rights workers and other leaders of people’s organizations assisting victims of military atrocities in Davao and Sarangani provinces in Mindanao. We also call on the military to pull-out troops from hinterland communities as their mere presence in these communities already endangers the civilian population. "This is reminiscent of the Arroyo’s war against the Filipino people, at a time when it was reeling from its isolation from the people and at the same time in a scurry to beat the deadline of its counterinsurgency program. Killings continue to go up," Karapatan Secretary General Cristina Palabay said upon receiving initial report on the killing of three persons in Surigao del Sur this morning, September 1. "And, just like the Arroyo administration, BS Aquino is expected to cover up these crimes and avoid this issue like it has not happened at all," Palabay said.